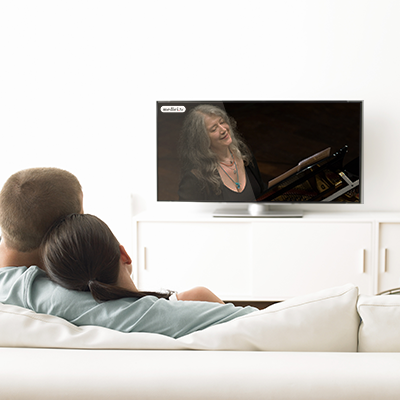 medici.tv is the leading online channel for classical music! Every year, we live-stream over 100 concerts for free from prestigious venues. We also provide unlimited access to one of the most extensive libraries of full-length classical music videos via subscription. Our selection includes over 3,000 works with the greatest artists, including Alan Gilbert, Alexander Kniazev, Anna Netrebko, Anne-Sophie Mutter, Boris Berezovsky, Cecilia Bartoli, Claudio Abbado, Daniel Barenboim, Daniil Trifonov, Evgeny Kissin, Garrick Ohlsson, Gautier Capuçon, Gidon Kremer, Glenn Gould, Grigory Sokolov, Hélène Grimaud, Jacqueline Du Pré, Jonas Kaufmann, Joshua Bell, Joyce DiDonato, Lang Lang, Leonidas Kavakos, Maria Callas, Martha Argerich, Maurizio Pollini, Maxim Vengerov, Mischa Maisky, Mitsuko Uchida, Mstislav Rostropovich, Natalie Dessay, Philippe Jaroussky, Plácido Domingo, Rafał Blechacz, Vadim Repin, Valery Gergiev, Van Cliburn, Vladimir Ashkenay, Yehudi Menuhin and Yo-Yo Ma. This year, the 17th International Fryderyk Chopin Piano Competition is partnering up with medici.tv. Follow the Grand Finale (October 18, 19 and 20) and the Prize-Winners’ Concert (October 21) of the 17th International Fryderyk Chopin Piano Competition live on chopin2015.medici.tv and on the Competition's official website.